There is a large quantity of copyrighted and licensed software available for use on the College of Engineering network. Typically every application has a different licensing method. Some software may be licensed to a particular machine or person. Other software may have a "floating node" license that limits the number of concurrent users. Some applications may be such gross consumers of network resources that their use is restricted to particular machines or users. Copyrighted and licensed software and documentation may not be duplicated unless it is explicitly stated that you may do so. When in doubt, DON'T COPY. The file servers on the College of Engineering network have a large, but finite, amount of disk space. If a user consumes large amounts of disk space others will be affected. Who the others are depends upon where the user's home directory is: undergraduates will affect other undergraduates, others will affect people in their department. Many printers are available to network users for print services. The majority of the software packages available for Windows/Linux workstations support PostScript printers. Only those printers operated by Engineering Network Services, designated as general use printers are subject to the usage guidelines herein. Printer accounting is implemented on all public lab printers. Users will be allocated 100 free pages per quarter starting the first time they print. Additional pages printed will be automatically charged to the users Bursar Bill at $0.07 per page. loading or printing any media for which the printer is not designed to use; prohibited materials include resume paper, transparencies, envelopes, etc. Instructors should encourage the use of e-mail for homework assignments. E-mail is very easy to use for such purposes and has the added benefit of providing detailed information as to when the completed assignment was submitted. See the section on use of E-mail for more information. 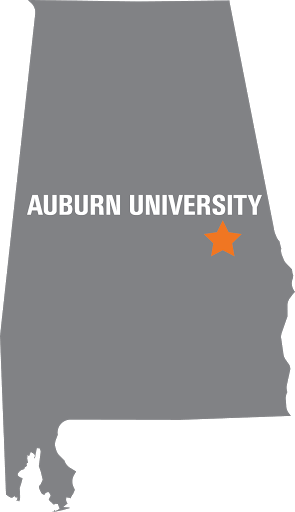 The College of Engineering network is directly connected to the Auburn University network (AU-net.) There are services provided to the College of Engineering users by other divisions of Auburn University. College of Engineering network users are bound by the policies of the resource provider when using resources outside of the College of Engineering network. Electronic mail (e-mail) is the primary form of communication between individuals on the network. Users are encouraged to read their e-mail regularly. Electronic mail lists covering various topics are available for subscription. Each user must request a subscription in order to be added to a mail list. For information on the available mail lists and subscribing, send an e-mail message to the user majordomo containing the word "help" in the message body. Extract and delete large mail messages from mail lists. Extract and delete all messages from large volume mail-lists over 30 days old. Undergraduates: Your inbox is not to be used to store files to avoid their deletion at the end of the term. All computers connected to the College of Engineering network will be registered with Network Services. This allows the college to maintain a consistent, secure computing environment. Network Services is able to keep track of software and hardware inventories and to ensure that all systems are updated to protect against emerging security threats. The college network supports all instructional and research needs. The network hosts a wide variety of hardware and operating systems. Managed (trusted) subnets meet most needs, but there are also designated research networks for unique needs. Consult Network Services for support. Dual boot systems are not permitted on trusted subnets. Violation of these guidelines will be investigated and the device will be blocked from the network.